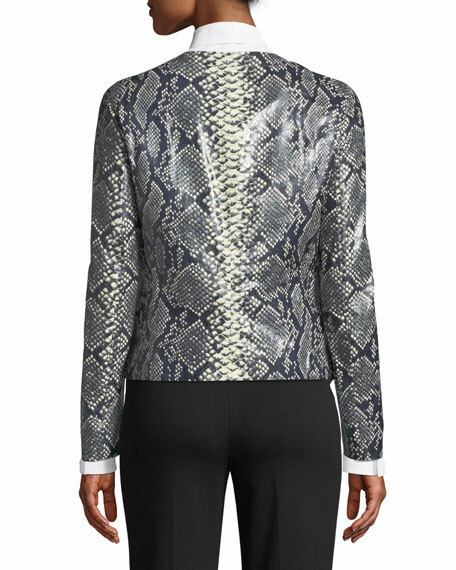 Escada jacket in lamb leather with snake print with golden button trim. 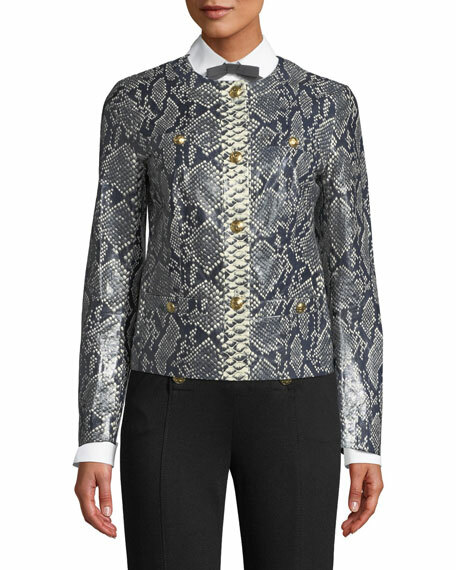 Badgley Mischka Collection "Alice" printed blazer with silvertone buttons. Notched collar; single-button front. Long sleeves; button cuffs. Waist flap pockets. 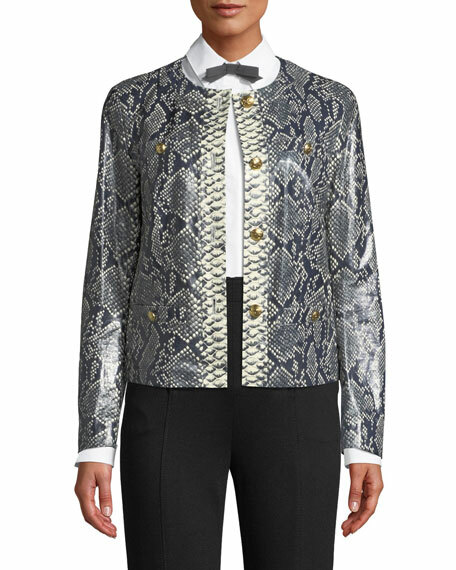 Badgley Mischka Collection "Alice" printed blazer with silvertone buttons. Notched collar; single-button front. Long sleeves; button cuffs. Waist flap pockets. Tailored silhouette. Straight hem. Polyester. Polyester lining. Imported. Brunello Cucinelli coat in glen check wool-cotton twill. Peak lapel; hidden double-breasted snap front. Long sleeves. Hip flap pockets. Fitted. Brunello Cucinelli coat in glen check wool-cotton twill. Peak lapel; hidden double-breasted snap front. Long sleeves. Hip flap pockets. Fitted. Virgin wool/cotton. Lining, acetate/silk. Made in Italy. Brunello Cucinelli double-breasted, trench-inspired jacket. Peak lapels with paillettes. Four-button front. Long sleeves; button cuffs. Chest flap pockets. Semi-fitted. Cropped length. Linen/cotton. Lining, acetate/silk. Made in Italy. Model's measurements: Height 5'11"/180cm, bust 32"/81cm, waist 24"/61cm, hips 35"/89cm, dress size US 2. Escada evening jacket in boiled wool-blend with golden buttons. Notched lapels; double-breasted front. Long sleeves; button cuffs. Diagonal flap pockets. Escada evening jacket in boiled wool-blend with golden buttons. Notched lapels; double-breasted front. Long sleeves; button cuffs. Diagonal flap pockets. Tailored fit. Long-line hem. Virgin wool/nylon/spandex. Imported of Italian materials. Model's measurements: Height 5'10.5"/179cm, bust 32"/82cm, waist 23.5"/60cm, hips 34.5"/88cm, dress size US 2.